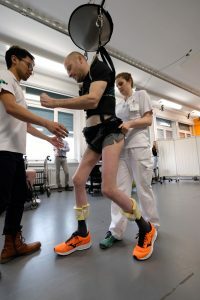 More than a decade ago, the words of the late Christopher Reeve inspired Grégoire Courtine, Ph.D., associate professor at the Swiss Federal Institute of Technology Lausanne (EPFL) to focus his research in the area of spinal cord injury with the singular aim to make patients’ lives better. Today, the report from his lab that three patients with chronic paraplegia have regained the ability to walk through targeted neurotechnology shows that he is well on his way to achieving that goal. 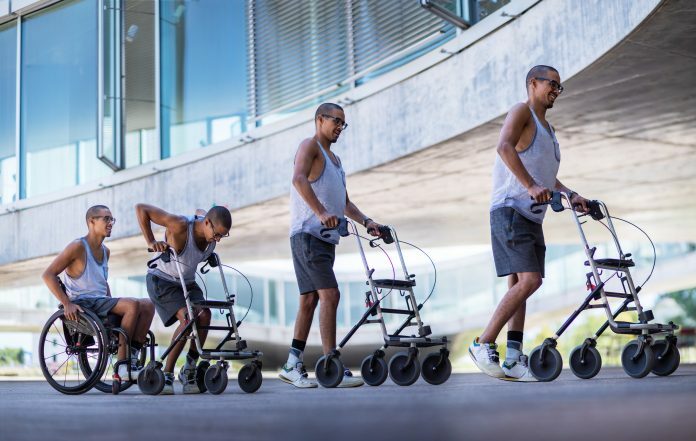 All three participants in the STIMO (STImulation Movement Overground) study, who had sustained cervical spinal cord injuries many years ago, are now able to walk with the aid of crutches or a walker. “Our findings are based on a deep understanding of the underlying mechanisms which we gained through years of research on animal models. We were thus able to mimic in real time how the brain naturally activates the spinal cord,” says Dr. Courtine. The work is published in two papers, out today, that report on different aspects of the project. 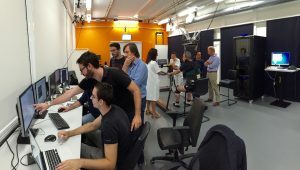 One paper published in Nature, titled, “Targeted neurotechnology restores walking in humans with spinal cord injury,” describes how the Swiss team introduced targeted spinal cord stimulation neurotechnologies that enabled voluntary control of walking in individuals who had sustained a spinal cord injury more than four years ago. How did they do it? The authors explain that they used an implanted pulse generator with real-time triggering capabilities to deliver trains of spatially selective stimulation to the lumbosacral spinal cord with timing that coincided with the intended movement. The participants were surgically implanted with an array of 16 electrodes over the lumbar region of the spinal cord, outside of the protective dura mater. This electrode array is connected to an implantable pulse generator which can be controlled with a personalized voice-controlled watch to administer short bursts of electricity. Because different areas of the spinal cord are activated during the different movements associated with walking, this system allows for preferential activation of those areas when the participant is trying to walk. “All the patients could walk using body weight support within one week. I knew immediately that we were on the right path,” recalls Jocelyne Bloch, M.D., neurosurgeon at Lausanne University Hospital (CHUV) who surgically placed the implants in the patients. Indeed, within one week, this spatiotemporal stimulation had re-established adaptive control of paralyzed muscles during overground walking, and locomotor performance improved during rehabilitation. “One of the most exciting pieces of this work,” according to Peter Grahn, Ph.D., senior engineer at the Mayo Clinic Neuroengineering Laboratory, is “the observation of sustained functional gains when stimulation was turned off.” After a few months, participants regained voluntary control over previously paralyzed muscles without stimulation and could walk or cycle in ecological settings during spatiotemporal stimulation. This is not the first time that this type of research has allowed previously paralyzed people to walk. Indeed, just over a month ago, two papers made a big splash in the same field: one from the Mayo clinic published in Nature Medicine and from the Harkema lab at the Kentucky Spinal Cord Injury Research Center at the University of Louisville, published in NEJM. Dr. Field-Fote points out that it is rarely the case in a spinal cord injury, even a severe one, that there is no activity below the level of injury. The epidural electrical stimulation (EES) still activates the circuits that the brain wants to communicate with but can’t, either because enough signals cannot get through or because of the demyelination of the axons, bringing them closer to the threshold needed to get them working. The companion paper published in Nature Neuroscience is entitled “Electrical spinal cord stimulation must preserve proprioception to enable locomotion in humans with spinal cord injury.” In this paper, the authors hypothesized that part of the reason that EES has had limitations to date is due to an interference between EES and proprioception, or the ability to know where your limbs (or other body parts) are in space. The results suggest that EES blocks a significant amount of proprioceptive input in humans, but not in rats. Dr. Field-Fote explains that this finding makes Dr. Courtine’s targeted approach of stimulation much more striking. In fact, the previous approaches of more general stimulation, where the proprioception may have been blocked, could have created an obstacle that patients needed to overcome. This may also explain why previous methods take longer training regimens to see improvement. Having this information has allowed Dr. Courtine’s team to identify stimulation parameters that don’t block the proprioceptive information. Dr. Field-Fote says that she “tends to be rather critical, but this group did a really good job” and that the work has “a lot of value for real-world function, mainly because it doesn’t require months of training.” It also expands the evidence to those with different spinal cord severity classifications which, to our knowledge, has not been studied before, according to Kristin Zhao, Ph.D., director of the Mayo Clinic Assistive and Rehabilitative Technologies Laboratory. Dr. Courtine refers to this as a “proof of principle” and is mindful to set realistic expectations for spinal cord patients. Dr. Zhao tells GEN that “the application of epidural electrical stimulation to enable functions lost due to spinal cord injury is in its early stages,” adding that the next steps “will involve improving our understanding of the relationship between physical therapy, stimulation parameters, and spinal network plasticity over long-term stimulation and addressing which patients will respond successfully to the intervention.” Dr. Courtine’s goal is to start the process in patients earlier, immediately after the injury. There is reason for Dr. Dietrich’s optimism. Dr. Courtine has made huge strides in a small amount of time. In his 2013 TED talk, “The paralyzed rat that walked,” Dr. Courtine explains that the neural network necessary and sufficient to coordinate locomotion is present below most injured spinal cords. But, they are dormant because the input from the brain is interrupted. His idea, all along, has been to awaken this network and he proved that he could do it in rats. Now, just five years later, he is able to do it in humans.